Thread veins (also known as spider veins) are an extremely common condition, affecting approximately 50% of the Western population, both men and women, of all ages. Although they have no detrimental health consequences, they can be unsightly, and can significantly affect a person’s confidence. There are a number of methods of treating facial thread veins, including laser, IPL (intense pulse light) and epilation. However, all of these techniques have significant drawbacks, such as a risk of scarring, and often require multiple treatment sessions. The technique we use at BrightNewMe is thermo-coagulation, using the ThermaVein system, which in turn utilises the Veinwave technology devised by world renowned vascular surgeon, Dr Brian Newman. Thermo-coagulation is the process of delivering a tiny amount of microwave energy, through a needle the width of a strand of hair, directly into the vein. This causes the vein to collapse in on itself, and immediately disappear (it is then reabsorbed into the body, permanently). The procedure is entirely safe, and the effects are very impressive. Dr Newman himself has performed this procedure on me, and I can testify to the efficacy of treatment. The same procedure, thermo-coagulation, can be used to treat a variety of vascular skin lesions such as spider naevi, lip angiomas, Campbell de Morgan spots (tiny red dots on the skin) and others. A condition commonly associated with thread veins is rosacea, or facial redness, and it is generally appropriate to treat both conditions at once. 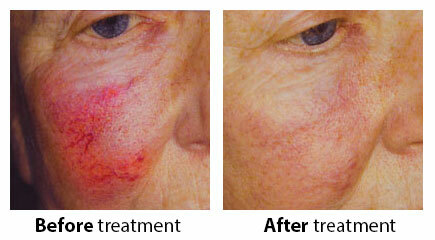 For rosacea I recommend a regime of prescription skincare, tailored to an individual’s specific skin type and needs. If you would like more detailed information about thread veins/ thermo-coagulation, including costs of treatment, please refer to our Frequently Asked Questions page, or alternatively book in for an initial consultation. Although we have a dedicated page for general client testimonials, below you will see a number of comments from patients whose thread veins we have treated. Click on the extract to see the comments in full. After contemplating facial thread vein treatment for several months I decided to visit Dr Sarah Norman’s clinic in Altrincham on 22nd May 2016 for treatment. 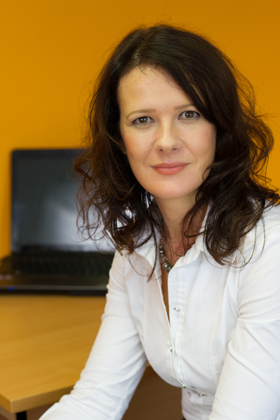 I was met by Sarah and I was immediately impressed by her relaxed, friendly and professional manner. She thoroughly explained the procedure which made me feel totally at ease and there was no pressure to go ahead with the treatment – this was entirely my decision. I chose to go ahead and the treatment itself lasted approximately 30 minutes. Throughout Sarah displayed a caring attitude ensuring that I was okay to continue. Following the treatment the results were immediate – I was absolutely amazed at the difference. Sarah also provided some skin care advice and some complimentary product samples. I have visited many skin specialists but never one like Dr Sarah Norman, who I wholeheartedly endorse. I have been unhappy with my skin since my teenage years: like a shadow, the feeling of insecurity and inadequacy followed me as I grew up. For over a decade, I have searched for a practitioner who could help me: trying IPL, lasers, veinwave (through other doctors) as well as expensive creams. This damaged my pocket, but worse were the experiences where I was left badly marked and I felt very low, thinking that no one could help me. I was recommended Dr Sarah Norman and I am so glad I was. Initially, I was wary due to my previous bad experiences, but I was quickly put at ease. Three treatments later and I feel better than I ever have about my skin. It’s a working progress and more treatments are needed; however, for the first time in my adult life – I can see the light at the end of the tunnel and feel positive that we will achieve clear skin (which is something I never thought I’d say). Not only is Sarah a great Doctor, but she is on hand when I need her – happy to talk and answer questions both before and after treatment, as well as being empathetic and understanding. I would recommend anyone with skin concerns to go and visit her. I’m now in my 50’s. I’ve suffered with rosacea since my teens and then thread veins on my nose and cheeks since my mid-twenties. Prior to consulting Sarah, I hadn’t realised that it was actually possible to treat rosacea and the IPL treatment that I’d previously had for my thread veins was so painful and the recovery time so long afterwards, that I wasn’t prepared to put myself through it again. On consulting Sarah I was therefore delighted when she was not only able to prescribe treatment for my rosacea (which has now improved dramatically), but also introduce me to the ThermaVein treatment that she has since used to treat the thread veins. In short, following three treatments the thread veins have completely vanished and although the treatment caused mild discomfort at the time, it was infinitely less painful than the previous IPL treatment that I’d had and the recovery time (to clear skin) was vastly reduced. In short, I am delighted with the treatment I received and the results that have been achieved; in fact my wife, friends and colleagues have all remarked upon what a difference the treatment has made and which I will definitely repeat again as and when the need arises in future.